Flowers that like both sun and shade locations give gardeners more flexibility in their landscaping plans, and the plants fit in places that are on the borderline between sun and shade areas. Sun and shade plants go well near or under young trees or shrubs where there the amount of sun available will change as the tree grows larger. Snow-on-the-mountain (Aegopodium podagraria 'Variegatum') is also known as Bishop's weed, or goutweed. Compound leaves are grey-green with white markings, grow 1 foot tall and will die back to the ground in the fall. White lacy flowers bloom in June, growing in flat-topped clusters on stems from 1-1/2 to 2 feet tall. Snow-on-the-mountain is hardy in USDA Zones 4 to 8, likes partial sun, partial shade or full shade and a soil that is moist and well drained. Periwinkle (Vinca minor) is also known as myrtle, creeping myrtle or Vinca and is hardy in USDA zone 3 to 8. The plant is an evergreen that grows up to 6 inches tall and 3 feet in diameter and likes partial sun, partial shade or full shade and a soil that is rich, moist and well-drained. Periwinkle produces dark-green leaves and blue-purple, red-lavender or white, five-petaled flowers blooming profusely in March and April and sporadically the rest of the season. Grassy-leaved buttercup (Ranunculus gramineus) produces blue-green, grass-like leaves and lemon-yellow flowers that bloom in late spring and early summer. The plant goes dormant in late summer and comes back with new leaves in the fall. 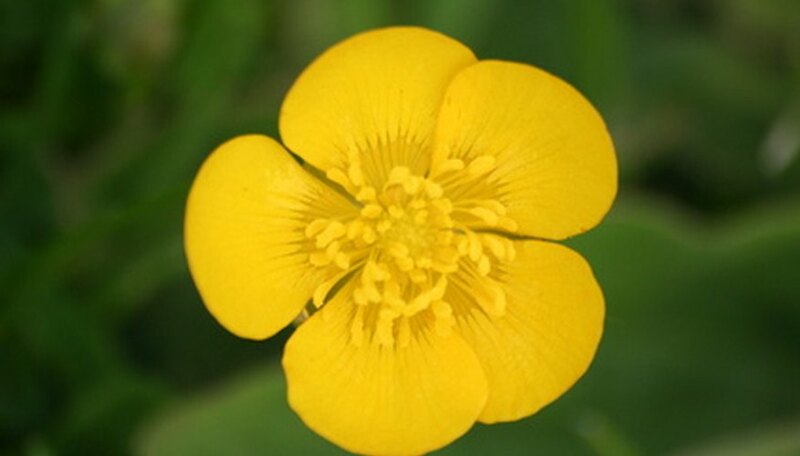 Grassy-leaved buttercup grows from 10 to 12 inches tall and 8 to 12 inches wide, likes full sun or partial shade and a moist soil. The plant is hardy in USDA Zones 5 to 9. Iceland poppy (Papaver nudicaule) is hardy in USDA Zones 2 to 9. The plant grows from 12 to 18 inches tall and 8 to 12 inches wide. The plant produces light-green leaves and large, delicate yellow, pink, orange, red or white flowers blooming from late spring to mid fall. Iceland poppy like full sun or partial shade and a soil that is moist to dry. Balloon flower Fuji white (Platycodon grandiflorus Fuji white) blooms from early through late summer and likes full sun and partial shade. The plant grows from 18 to 23 inches tall and 12 to 18 inches wide with dark-green leaves and star-shaped white flowers. Plant balloon flower Fuji white in an average, moist soil.